Your personal brand is the foundation of your social selling efforts. Follow these best practices for building a social brand that helps you succeed. Sales professionals need to be present and active wherever their potential buyers spend time. These days, that includes social networks. This post covers the essential elements to creating and developing a social brand that paves the way for successful social selling. It’s well known that a majority of buyers turn to social networks for information about potential solutions and vendors. Imagine you reach out to a sales prospect. The buyer looks you up on LinkedIn but your profile doesn’t include a picture or much information about you. It makes the prospect wonder whether you are credible and whether your company is legitimate. With so much competition for a decision maker’s attention and time, a strong social brand is one way to stand out. It inspires prospects with confidence that you are someone they can see themselves doing business with. But your social brand isn’t just meant to grab attention – it’s meant to help you engage with today’s highly selective buyers. That’s why your brand should also portray you as a subject matter expert that prospects can trust for insightful perspectives and helpful advice. By sharing relevant industry content and commenting on news and trends, you break free from the “just-another-sales-rep” mold and position yourself as valued partner. So how do you develop a robust and professional online profile? Start with a professional photo that leaves viewers with a positive impression and paves the way for interactions. 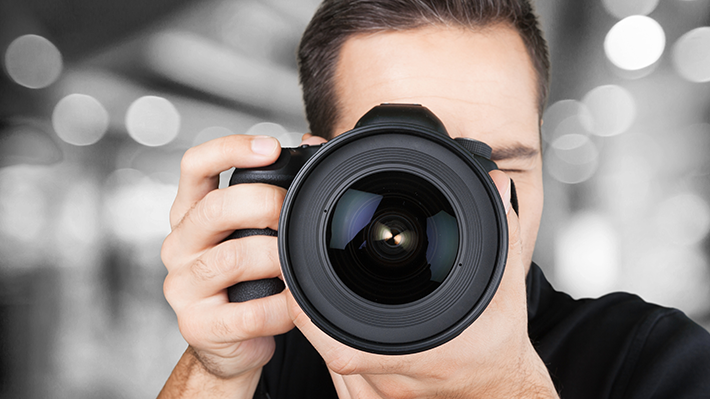 Good photos are high-resolution images that reflect your personality and professionalism. 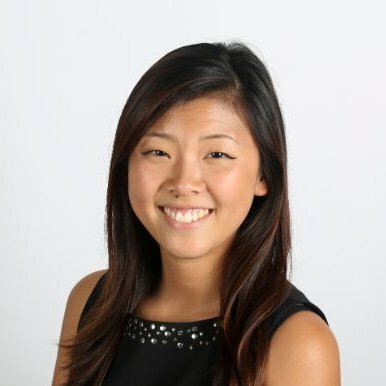 That means a recent photo featuring only you in professional attire, looking personable and posing against a neutral background or in a relevant work setting. Go for a close-cropped photo, one that shows more of your face than anything else since that should be the focus. Pair your photo with a strong headline and summary. Your headline and summary should showcase what makes you, you. You can summarize your career like a story, share a personal story that has shaped who you are, or sprinkle in your personality however you want. The point is to evoke engagement with the person who views your profile. In today’s highly visual world, multimedia content can further help your profile shine. Consider including videos that your company produces about topics of interest or ones featuring you discussing top-of-mind issues and trends. Or you could post testimonials explaining how your company helped customers overcome challenges and achieve their goals. You could even showcase your unique professional story by uploading SlideShares that walk prospects through a compelling before-and-after scenario, or present thought-provoking ideas. By taking advantage of multimedia in your profile, you increase the likelihood of attracting more attention and more sales opportunities. Because prospective buyers often spend time on more than one social channel, it’s smart to branch out. 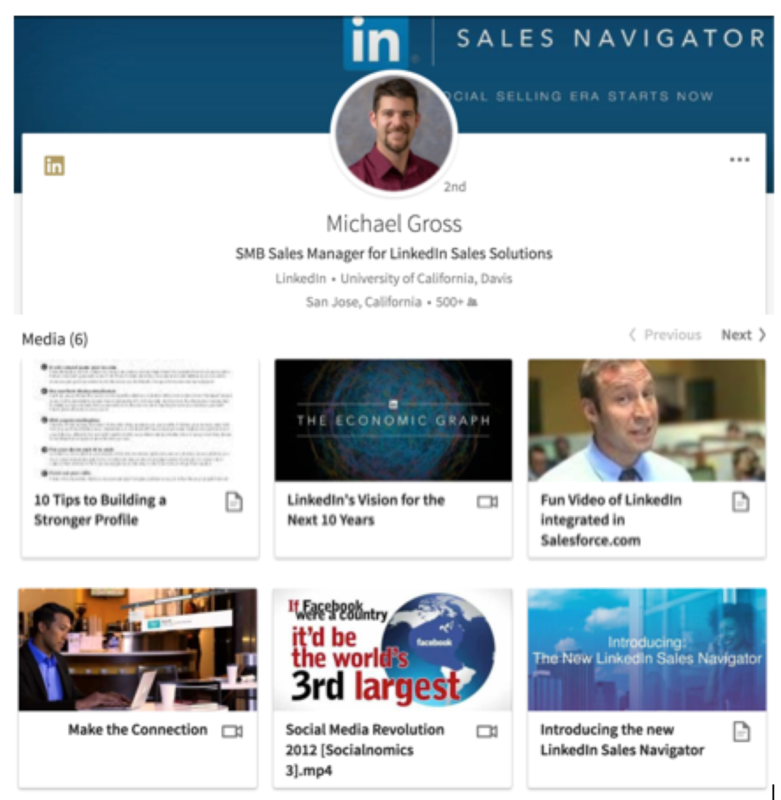 The good news is that integration between LinkedIn and Twitter makes it easier to share the information and content you post on LinkedIn. By adding a Twitter account to your LinkedIn profile, you can share LinkedIn updates to your Twitter account. Because you only get 160 characters for your Twitter bio, you need to concisely craft a description that conveys your experience and value. Make it focused yet enticing to those you are trying to attract and engage. 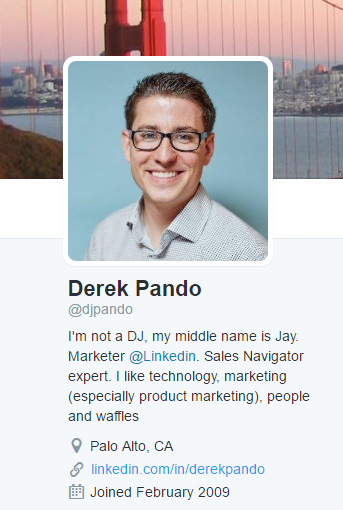 Here’s the Twitter profile of my colleague Derek Pando (below). I like this example because it nicely captures Derek’s personality and approachable nature. It’s also helpful to share which topics you’re interested in so that people know why they should follow you and what to expect as a result. If people want to learn more about LinkedIn Sales Navigator, technology, product marketing, or maybe even waffles, they can see that Derek is a relevant person to follow. You can also create and register a custom hashtag that will help people identify you more easily. For example, social selling and personal branding expert Mario Martinez Jr. uses #dontdonormal on Twitter. Using a hashtag in your Tweets can help you grow your personal brand recognition. Hashtags are also clickable, making it easy for prospects to quickly find all your Tweets on a specific topic. Remember, it’s in your control to shape your social brand. Your social profiles are the foundational elements of that brand. Once those are in place, activate the power of social selling by staying engaged, measuring the impact of your efforts, and experimenting with new ideas and approaches to drive better results over time. Learn how to stand out in a competitive landscape. Check out How Personalized Selling Unlocks Competitive Advantage.